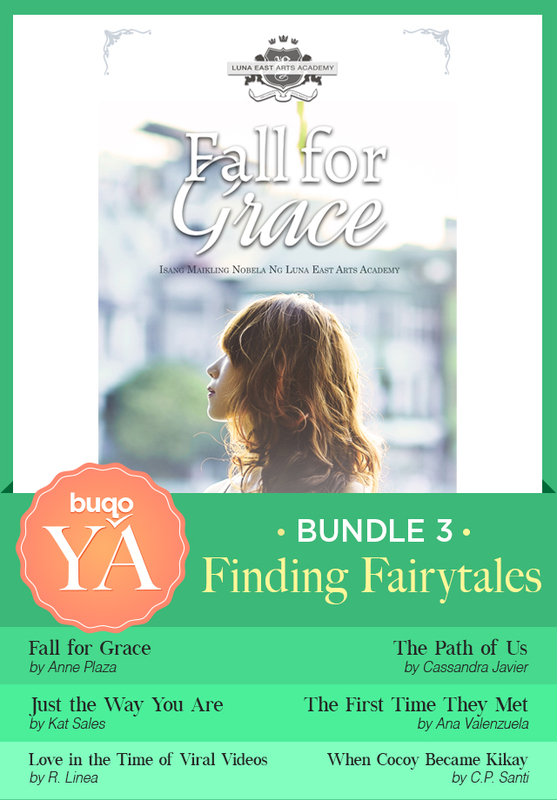 #buqoYA Bundle 3: Finding Fairytales | We all want the happy ending, the dream come true. But what if it doesn’t happen? How far would you go to get that “ever after?” Would you change who you are? Would you swallow your pride? Is the story really going to be as perfect as you think? Follow the path of these characters and see where they lead. BUY THE BUNDLE HERE. It’s review time once again~ and this time, I’m doing two stories from the third #buqoYA bundle called Finding Fairytales. Admittedly, I haven’t read all of the stories in this bundle yet (because work hinders everything fun in life, yes?) but I hopefully have read enough to be able to do justice to Fall for Grace by Anne Plaza and Love in the Time of Viral Videos by R. Linea. First, an excerpt from Fall for Grace. There’s something about well-written fiction in Filipino that appeals to me, especially in this day and age where most Filipino writers put out books in English, and most youngsters do not know how to use proper Filipino in written (or spoken) communication. In high school and college, I used to write fiction in Filipino as well, an exercise to make Gat Jose Rizal proud–no, really–but when I started working in different companies and got to know friends from different parts of the world, I began writing more fiction in English to make them more universal. Anne Plaza’s story Fall for Grace is in very good Filipino, and that’s the first thing that got me to read it. There’s also something about the dynamic of high school cliques that gave me a throwback to my own high school days. I think it was a good touch, especially for someone like me whose teenage years seem so far away now. Somehow, I was able to see, feel, and even smell my own alma mater while reading this, though if you ask me if mine was ever as extravagant as Luna East, I would say no. Plus points for: Making me want to write in Filipino again. Because of this story: I cringed remembering all the math I had to do in high school. Why didn’t I have a Jason of my own to tutor me too? Oh right, all-girls school. Darn it. Reading this story needs a lot of focus, at least that’s what I tell myself now, because I started reading Love in the Time of Viral Videos while juggling two tasks at the same time. And let me tell you, it gets pretty confusing. I chose this story to read because I’m a bit of a social media addict, and I felt like I’d be able to relate to it. The storytelling style surprised me in a pleasant way, because it’s new to me. Quirky and a bit confusing, yes, but you gotta give props to the author for taking that risk and doing a good job in trying to capture the voices of different social media networks we use daily. It’s also in this style that I wish I could see R. Linea write more pieces, to hone this little idea he started and make it his own. There’s room for improvement, but the brilliance is already there. I’m sure he can come up with another story that makes use of more social media channels, and I’d love to see how he could put her own spin to it. As for Patch and Sebastian . . . I loved their bickering. I don’t know what it is about bickering couples, but it makes me feel more kilig than lovey-dovey ones. There’s something about a constant exchange of snippy comebacks that’s very cute to me, and Patch and Sebastian’s conversation was peppered with that. Call me a happy camper. And yes, give me more. Please? Plus points for: Exploring a quirky storytelling style and sticking with it. Because of this story: I kind of want to go back on all my social media posts and think of what kind of story they will tell, from another person’s point of view, that is. Let’s continue supporting Filipino authors buy buying all the #buqoYA bundles found here! For other reviews on this bundle, check out Oops I Read a Book Again‘s Finding Fairytales post. There are two more tours coming up for bundles #4 and #5, so do watch out for that. And oh~before I forget, CLICK HERE FOR A CHANCE TO WIN A POWERBANK FROM BUQO (Philippine residents only)! Ikaw, paano ka naging Leading Lady?